Have you ever seen this flag before? My brother-in-law, who is Japanese, says the Kanji on the flag reads "National Defense Committee Kikusui Unit", which my brother says was a Kamikaze unit operating around Okinawa in 1944. Any additional information would be helpful. I have not heard the organization as Kamikaze unit. 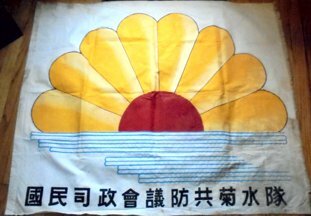 The flag reads anti-communists Kikusui (= chrysanthemum and water) unit. It seems to be more right wing party rather than military unit. I am wondering why they fought against US in Okinawa. So these leads me to think that there were several waves (and even possibly) several operations of the same sort, numbered (at least) 1 through 6 (most likely 10 overall). 2. Operation Flying Chrysanthemum 2. It also seems that several Japanese submarines were used in this all out operation (not only using planes but also ships, as the already mentioned sources cite). The submarines were fitted with manned suicide torpedoes Kaiten, "Kaiten (Return to the sky), commonly rendered as: "The turn toward heaven", or "The Heaven Shaker. [Source: Wikipedia article: Kaiten] and the list of these vessels that participated in such actions (to which the pennant attached and forwarded by Rob may belong to) is here [Wikipedia article: Kaiten Carriers]. Maybe by looking at the exact date (regarding the operational day, from this list we could probably find out to what ship it belonged to. Further research on Google Japan shows by typing keyword Kikusui) the following types of military hardware were used by this "special unit" [Source: Kamikaze images]. The Kamikaze (divine or spirit wind), officially Tokubetsu Kogekitai (Special Attack Units), abbreviated as Tokko Tai, and used as a verb as Tokko (special attack) [Source: Wikipedia article: Kamikaze), all of them showing the "Floating Chrysanthemum" logo/decal [Sources: Auctions on Yahoo. 3. Captured US plane - DC-3 and see also (photo here). [Source: Blog on Yahoo] Several World War II docks, shipyards, monuments, museums and outdoor displays also feature the same logo in their exhibits (see this example, Source: (located here and here.) as homage and tribute to these men who sacrificed their lives in defense of their homeland. 3. Map of one of the attacks. Here's an example of one of these Units, featuring Japanese submarines I-36, I-37, and I-47. All in all, "Japanese Special Attack Units (tokubetsu kogeki tai, often abbreviated to tokkotai), also called shimbu-tai, were specialized units of the Imperial Japanese Navy and Imperial Japanese Army normally used for suicide missions. They included Kamikaze bombers, Fukuryu (Crouching Dragon, suicide scuba divers), and several types of suicide ships and submarines." The Ministry of Defense of Japan even features the logo on one of its pages. - Tokkotai Commemoration Peace Memorial Association, Tokkou (Special Attack Forces) web site. There existed Kikusui Operation and Kikusui Unit as Kamikaze: They left head band as in this photo. However, the English translation as the "National Defence Committee Kikusui Unit" is wrong. A more accurate translation is the "National Administration Meeting Anti-Communist Kikusui Corp."
The flag in the photo does not look old and I think it was for a party formed after World War II as rightest organization. On second thought, I have to agree with you that the flag provided for identification is not old indeed, but rather new, and that the meaning of a "National Anti Communist" movement (regardless of the formal name that it can actually have), would mean that there is a post War movement identified (or labeled) as National Defence Committee (maybe a far right organization/party/movement?). As I mentioned earlier, the logo of the Floating Chrysanthemum has other current uses, so it is not exclusively WWII-era related... 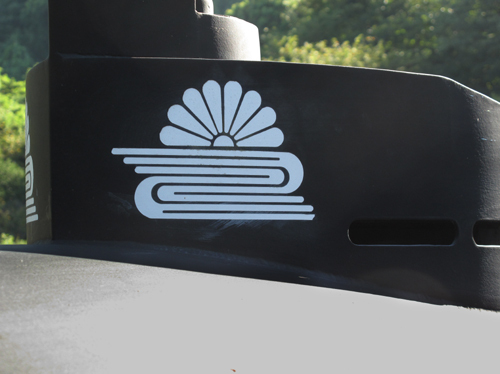 However, there were indeed Special Units (as research provided) that not only displayed this mark/logo, but actually flew a Pennant (you may call it flag also) on their conning tower, like the Japanese submarine I-366. Could you provide further information on where you got the National Defence Committee Kikusui Unit name from (aside from the Forum you mention)? 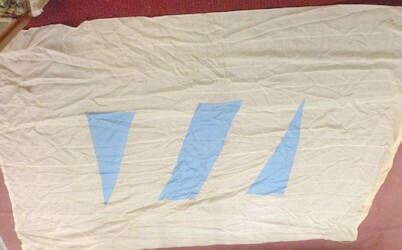 This flag is identified as a variant version of a Silver Line House Flag. This has been identified as a flag of the Yarmouk Martyrs Brigade and moved. Can you please ID the attached brooch pin of a blue ensign. I think it is possibly a yacht club. 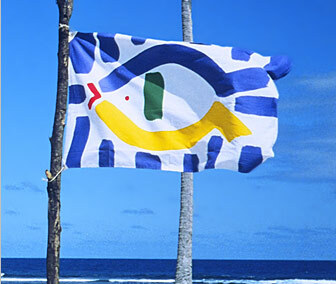 New Zealand has a tradition of blue yacht ensigns with a white cross (see New Zealand yacht ensigns). Depending on how old the pin is, it could be related to the Auckland Sailing Club, which later became the Royal New Zealand Yacht Squadron (RNZYS), although that club is reported to have flown a badge in the lower hoist. If the pin is new, then it could be a rather simplified (showing a Union Flag rather than a New Zealand Flag in the upper hoist) form of the present RNZYS ensign. I suggest that you direct the question to the RNZYS. In addition to the above: I found Tasmania adopted on 9 November 1875 a state flag which was a British Blue Ensign (1875) quartered by a broad white cross, dividing a Southern Cross appearing on the fly. (The flag also shown on Ausflag) This flag was withdrawn after only a few weeks when it became known that the design did not conform to the British Admiralty's rules for Colonial Flags. Could it be that your pin is from Tasmania? And that the Southern Cross was omitted because it would have been to difficult to incorporate it on a pin? (Mark that the canton on the pin is also not very accurate). To conclude what I indicated before: The pin could be a simplified presentation of the Tasmanian flag of 1875 or of the Auckland Sailing Club. In both cases the Southern Cross would be missing. We have this flag we picked up at a local sale. It measures about 22 x 28". Would you know what this might have been made for? We would appreciate any help. 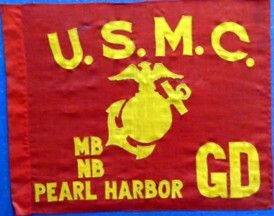 It is a guidon of the Guard Detail at the Marine and Naval Barracks in Pearl Harbor. Consult the USMC Flag Manual (available on line) for further information. 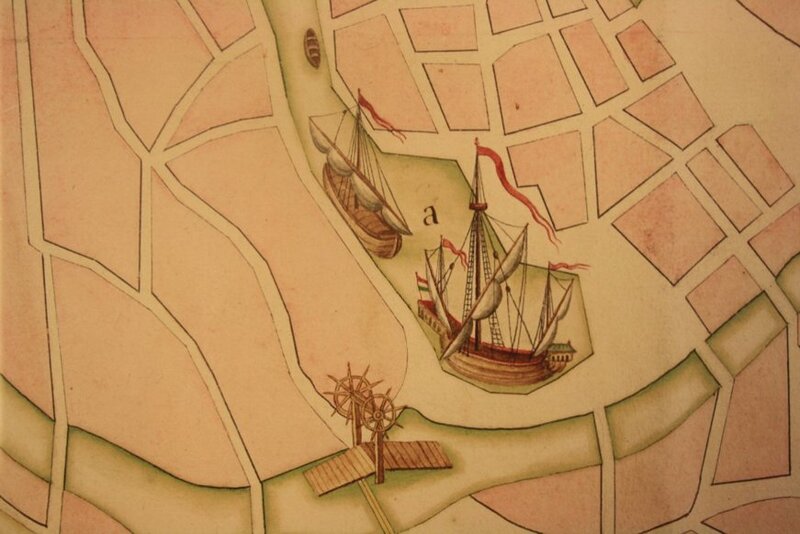 Currently I'm studying an early sixteenth-century painted map of Bruges (Belgium) for which different scholars have tried to formulate an hypothesis about a more precise dating or year in which the map would have been made. 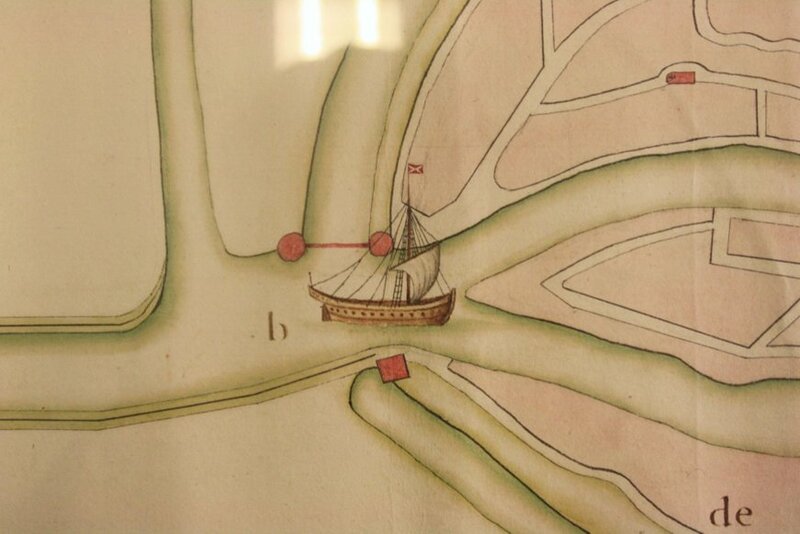 As a last-year history student I'm hoping to come as close as possible to resolve the mysterious dating of the map. To that end I'm following all different kind of leads, even those that seems highly unlikely to give results. My research so far has indeed confirmed what all historians have said, namely that it most likely dates somewhere in that sixteenth century. Several iconographic indications have shown that it probably dates from somewhere between 1536 and 1560. Somewhere in time the right side (about a third) of the painting, depicting was separated from the rest of the painting and is now the only part that's left to us. Luckily, there are watercolour copies that show to full painting, but unfortunately to save time they have not copied every single detail in these watercolours. They can thus not be used to attempt and reconstruct what the whole painting would have looked like. However, and now I'm nearing in on my reason for contacting you, the ships are about the only thing copied into detail. Just to be clear, it's a map that stresses trade and sea accessibility of Bruges, so the ships are all merchant vessels. Research shows that their appearance corresponds with a dating in the sixteenth century. I've become intrigued with the flags and banners on these ships, which no one has given attention to yet. To the best of my ability I've used literature, search engines etc. available to me, but I haven't been able to fully identify the flags with a sensible result. All pictures in attachment are labeled 1 to 6, for easy reference. Most of these ships have a red pennant attached to the main mast, to my understanding it were usually the colors or flag of the landlord/king that were attached here. On picture 1, this pennant is green, however this might be an error of the copyist, since another copy shows this pennant in red. At the end of this pennant there is a Burgundy Cross Flag, using your website and several other sources I was able to identify it. I'm not sure how to interpret it being there, it doesn't seem to narrow my dating since it was used both by the Burgundian dukes as the Spanish kings thereafter. This flag features just once on the whole copy, the reverse version, however, is shown most often. Although it appears that it's a regular saltire in this case, and not a cross of Burgundy. Yet, it has to be noted that on the painting itself buildings are also represented quite simplified. That the cross is a regular saltire, might be a simplification of the painter, not the copyist. I'm not at all an expert on flags, I even have to admit I don’t know the slightest thing about them except from what I could find in literature. Therefore I was hoping to get your input on these flags. Maybe it's easier if I formulate some specific questions, but any other remarks are most welcome of course. 1. Picture 1: the green colour of the pennant left aside (since the other copy shows a red one), is the Flag of Burgundy depicted as a version you could see appearing also under Spanish rule? Or would you think merchant vessels would sail under a different flag? 3. Picture 5-6: There is a totally different flag visible here. I looks like the flag of the Netherlands, which came into use when the Dutch Republic was found in 1585. This year isn't consistent with the dating in the sixteenth century. 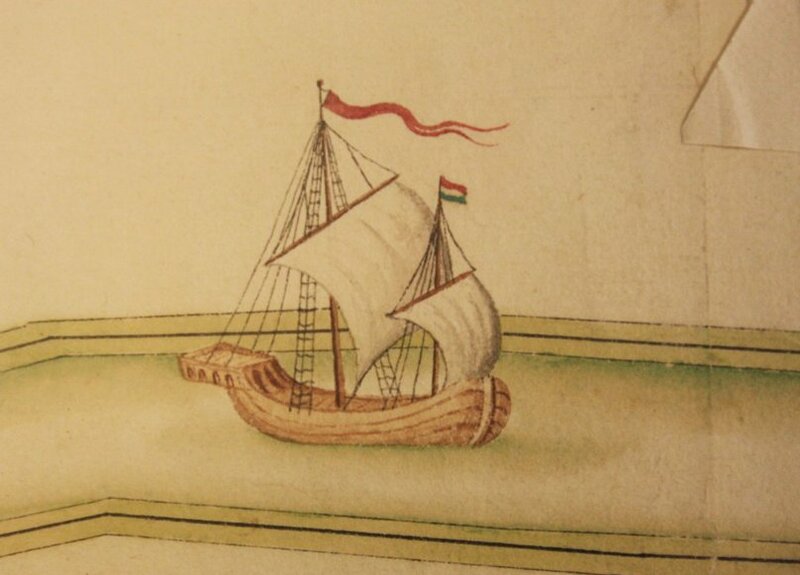 A flag similar to this might have been in use for ships sailing from cities at the West Coast of the Northern Netherlands, before the year 1585. I'm quite at odds what to make of this. Would you think this could be the Flag of the Republic or perhaps a more regional flag related to merchant nations? I understand these are really specific questions that perhaps aren't solvable. As you are listed as director of FOTW I decided to contact you. Of course I respect your agenda, and if you need time to look into this I gladly await your remarks. I would be glad though, if you could indicate whether you have received my e-mail. We have tried to compile all known saltire designs, and you will see that the white saltire on red is surprisingly rarely used, both historically and in the modern context. Spanish Cross of Burgundy flags were always red crosses on another colour, usually white, rarely yellow or blue, but they were sometimes simplified as saltires. I guess it's possible the artist got the colours reversed. The inverse colours, however, do not have any historical context known to me. Then there are the two oddities - my thoughts when I see 16th C red-green flags immediately turn to Tudor flags in England. However, to my knowledge, no Tudor flags ever employed a white saltire on red – they continued to use versions of the St. George’s cross (red upright cross on white). The final flag does indeed look like the red (orange)-white-blue of the Netherlands, but the earliest mention of the "oranje-blanje-bleu Prinsevlag" is 1572. In conclusion, my opinion is that the flag is fictional, and may have been used specifically because it did not correspond to any known combination of colour and design. A follow-up on a message from a few days ago concerning the white saltire on red. I recommend you view this image on this image - an amazing number of flags in this battle, with all sorts of combinations of cross of Burgundy and the Dutch princevlag. Your remark on the flags being fictional and unidentifiable on purpose is quite interesting. Perhaps the Cross of Burgundy Flag being clearly depicted is a mere recognition of the Duke of Burgundy or King of Spain. With the other flags then being merely fictional, that's interesting itself. On another note, I didn't believe the coincidence, but today I traveled to the Netherlands and visited the Zeeuws Museum in Middelburgh. They have several huge tapestries on display, which I wasn't aware off beforehand, displaying naval battles between Spanish and Dutch ships. The amount of flags on these tapestries is incredible. The Cross of Burgundy Flag features regularly on these ships, also in adapted form with a differently colored field. Then, on the very last tapestry something caught my eye. Certain ships here also have the mysterious flag with the white saltire on a red field, the inverse version of the Cross of Burgundy Flag! Maybe this is interesting information when looking at the flags I had send in the previous mail. Unfortunately I couldn't take pictures from the tapestries themselves and the museum couldn't provide high quality ones. What I send in attachment is a picture of a printed picture, so my apologies for the bad quality. It's less clear here that the flags in question are in fact the inverse ones, but I can assure you from seeing the tapestry the colors are in fact the red field and white saltire. Not sure if this would aid FOTW in any way, but if you're interested in using the tapestries as a reference source. From one of them I could find a high resolution image, under this Link. If you Google Zeeuwse Wandtapijten you might find more useful material on these tapestries. 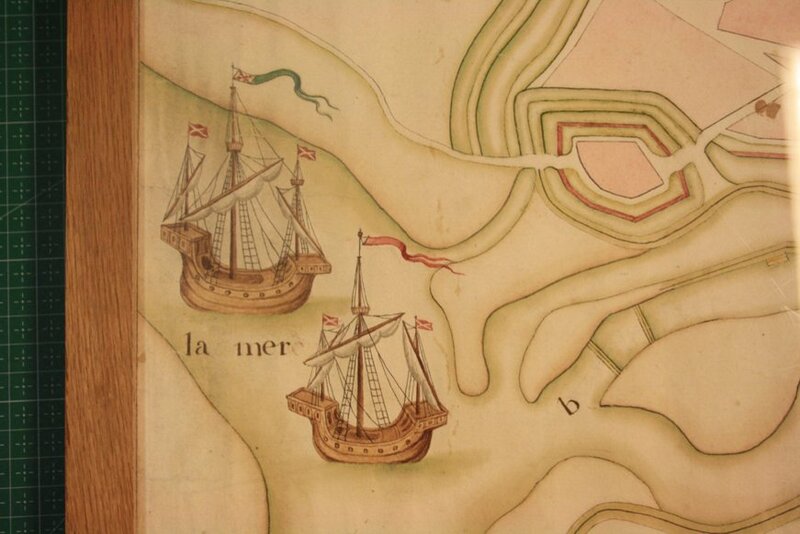 To give some context, they depict the War in Zeeland (1572-1576) as part of the Eight Year War. However, the tapestries themselves were made during 1593-1604. I'd be willing to assist with more context if that would interest you. 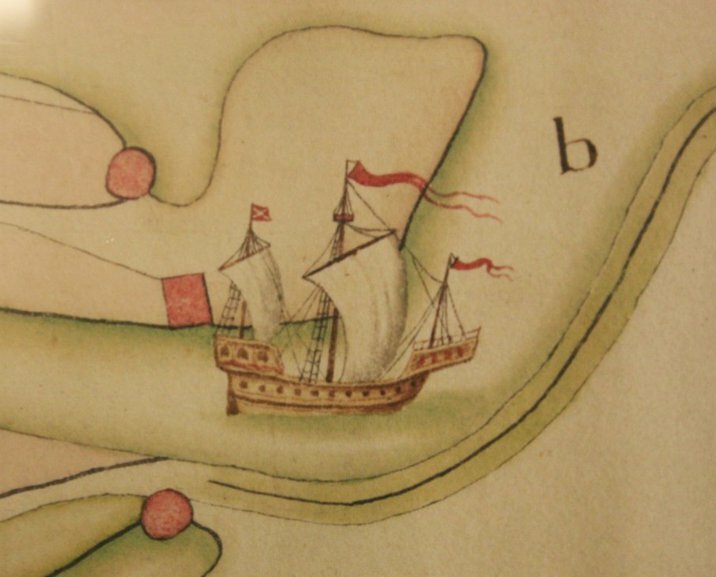 - Photo #1 shows a known long green-white Tudor pennant. - Photo #2 shows one very similar to the Streamer flown by the H.M.S. Tiger. - Photo #4 shows a plain red streamer similar to that shown as a Royal Navy Streamers flown by the H.M.S. Lion 1745. However, the ensigns with the white Saltire on a red field (appearing in photos #1, #2, #3, and #4) were more puzzling, perhaps even religious in nature, I thought, perhaps Jacobian? They appear to be a kind of reversed Cross of Saint Patrick, but more likely they were simply examples of artistic license. Now the red-white-blue horizontal tricolor (Photo #5) was interesting, because it looks very much like one of the former flags of Bruges. This reasoning continues to weaken the idea that these were English ships. At the moment, I'm stuck because I can't think of a historical time that the English would fly a flag of Bruges, can you? So in the end, I'm not sure the ships were English, and this brings us right back to where we began. Any new thoughts out there? I've nothing new to add I'm afraid, just a reminder, and that is that one shouldn't take the detail of such a painting too seriously. 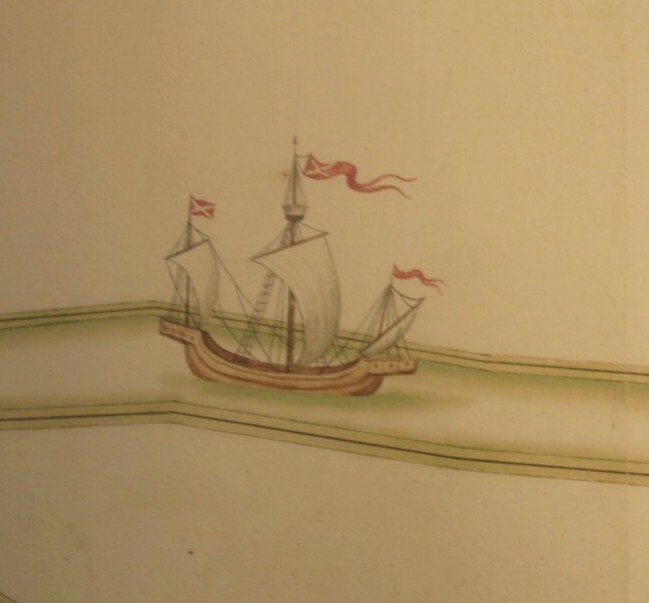 It is worth remembering that the tradition of accuracy in marine paintings didn't begin until many, years later (the Dutch Wars of the mid-17th Century and the van der Veldes spring to mind) so one has to be very careful. It could be that the artist exercised his imagination in creating this image, but we just don't know? 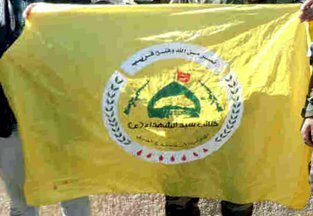 I found this yellow, alleged ISIS related "Tikrit Iraq" flag - by searching "Christian Iraq Flag" on Goggle. As I don't read Arabic, I can't add any info regarding it. As to why Google linked to this as a "Christian ISIS-Tikrit flag", I don't know. This flag and text has already been identified as that of the Battalion of the Sayyid's Martyrs. 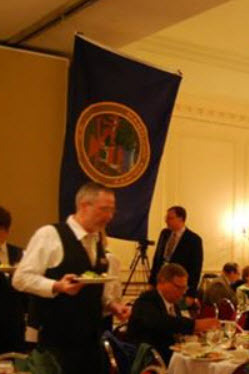 Can anyone identify this county flag hung from the ceiling at a New York State Association of Counties event, posted on the organization's official Facebook page? I'm thinking it's Madison County, but I'm not sure. 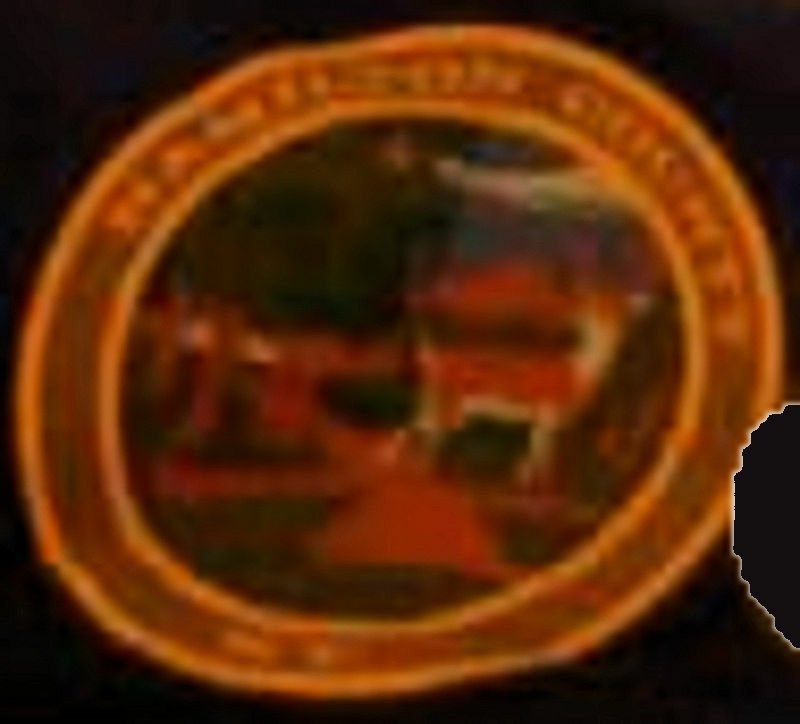 I see what might be the reverted seal of the Hamilton County, New York. On the right, I see a deer and on the left a tree. I recognize no "American" shield. It is not Madison County. I think this is the same flag. Taking just the photograph and ignoring the hall, and the field of the flag (which everybody probably will agree is a blue field), and rotating the emblem gives the attached . If you zoom in enough (600% does it for me), you'll find that along the top of the emblem, it says "Hamilton County". Checking our website shows there is indeed such a county in New York state, and we have a quite similar flag for it. It's not exactly the same, though. Most noticeably, the darker green ground that the animal stands on in our image is a brown in the flag on the photograph. Do we have someone in New York who is close enough to go ask or write? They might also be willing to share a written description we could use. Has anyone been able to find out yet why the colours on this flag differs from the colours we have at Hamilton County, New York (U.S.)? We could then add the UFE part to the correct place. Does anybody recognize the EA Flag shown above and its origin? 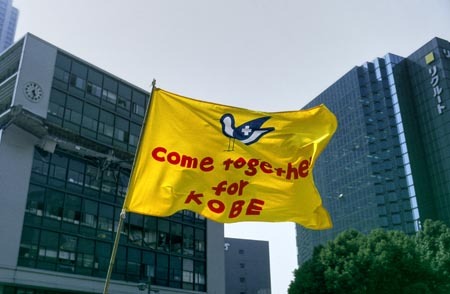 There was even a flag on the same website - Together for Kobe - intended for the relief work after the Great Hanshin earthquake (Hanshin Awaji daishinsai), or Kobe Earthquake, which occurred on January 17, 1995. The two flags in question have been identified as the flag of the Constitutional Court of Turkey and that of the Justice Academy of Turkey. This image shows a row of UFEs. The picture was taken at the "Shaolin Monastery, or Shaolin Temple (Sháolín Sì), which is a Chan (Zen) Buddhist temple in Dengfeng county, Zhengzhou, Henan Province, China. The name refers to the forests (lín) on Shaoshi (Shao Shí) mountain, one of the seven peaks of Song mountains (Song Shan). Dating back 1,500 years it was established in 495 AD by Emperor Xiaowen of the Northern Wei Dynasty for the Indian monk Batuo (Buddhabhadra). Shaolin Temple remains the main temple of the Shaolin school of Buddhism to this day. Founded in the fifth century, the monastery has been long famous for its association with Chinese martial arts and particularly with Shaolin Kung Fu. (Additional source #1 and Additional Source #2) There's also another picture (copy protected) featuring the flag of the Shaolin Monastery on PhotoShelder. For additional information on the Shaolin Temple also see the Shaolin Official Website. 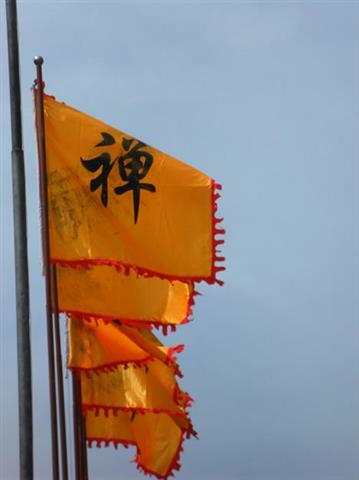 The caption is "Flags outside the temple grounds". I'm not sure whether the writer meant to indicate they were unrelated to the temple. I expect the writer wouldn't have been interested in finding out the meaning of the flags, but do we have anyone who can at least read the writing on the front-most flag? My name is Catherine Macfarlane. I'm from Sydney, Australia. I'm writing to you because one of my aunt's neighbours has some flags up & we are curious as to what they are. We have never seen this flag before. I've tried doing an online search and can't find anything. My aunt lives in a large multi-cultural area where many Muslim people live. We were wondering if the flag had anything to do with their religion although we don't know for sure if the neighbours are Muslim or not. Do you happen to know what flag this is? Is it a flag of a country or does it represent something else. May I ask where in Sydney did your aunt spot this flag? I've forwarded this to the FaceBook group "I love the flags of Australia." Hopefully someone there might know. It's on someone's balcony at Auburn. Although Auburn has a large ethnic Turkish population, the flags do not resemble any known Turkish regional or political emblem. Nor do the flags contain any obvious religious symbol, nor do they match any of the local sports team colours either. Therefore the flags are most probably just party decorations of some sort, made with three different fabric patterns sewn together. More info about those flags I asked you about. I just got a email back from that local area's mosque. They say they don't recognise the flag either and it does not represent anything in Islamic religion or the Turkish culture. I had assumed that because it was in a very Islamic populated community it was probably something to do with Islam. Is really got me more curious now. I have been reading with interest your flag identification inquiring. May I suggest that you ask your aunt to knock on the neighbour's house, and ask them what the flags represents ? Hopefully the neighbour will be flattered that someone has taken notice of their flags. I suspect that Miles Li's suggestion that they may be just decorative flags, is highly probable. Meanwhile I add this image to FotW-ws. It's around 3:5 with three unequal vertical areas: At the hoist a narrow area, roughly 1/3rd of the flag's height in width, in a black and white zigzag pattern with approximately 20 horizontal stripes, then a dark blue area of approximately the same width, with eight white stars set regularly in two rows very close to the edges (and maybe three smaller ones interspersed along the vertical midline), and at the fly a plain green area, roughly square. No idea of what this flag is, but a black and white stripped area along the hoist makes me think of the Maldives - the pre-1968 and pre-1949 flags shared this unusual feature. We already have a section titled "Unidentified Cambodian Flags". So here's another to add to the collection. It comes from a picture of King Norodom Sihanouk funeral ceremonies. 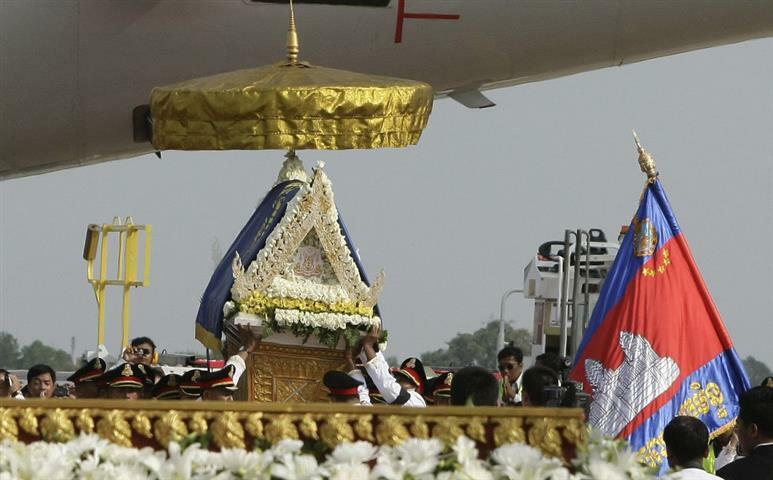 The picture credits read: "Police officers carry a casket carrying the body of Cambodia's late King Norodom Sihanouk upon arrival at Phnom Penh International Airport in Phnom Penh, Cambodia, Wednesday, Oct. 17, 2012. AP/Heng Sinith". This flag follows the same pattern as two flags already reported (here) and (here) where there's a basic Cambodian flag pattern established, followed by golden fringes on the edges, a badge (Coat-of-Arms) of the official institution on the hoist (usually Police and Military Coat-of-Arms). It is my conclusion then, that Police and Military Unit flags are the UFEs we are trying to identify on this Cambodian UFE page.